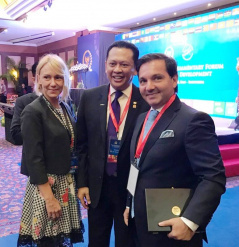 The Deputy Speaker of the National Assembly of the Republic of Serbia Prof. Dr Vladimir Marinkovic and MP Stefana Miladinovic took part in the Second Parliamentary Forum on Sustainable Development and UN 2030 Agenda in Bali, Indonesia. The global forum, held on 12 and 13 September, was attended by the representatives of 46 parliaments from all over the world. The topic of this year’s conference, organized by the Indonesian House of Representatives was: Partnership towards Sustainable Energies for All and the parliamentarians spoke about the importance of cooperation between states on matters concerning sustainable development, new technologies, energy and poverty reduction. In his address, Deputy Speaker Marinkovic presented Serbia’s strategic goals and the country’s progress as regards the economy and economic growth which is essential for sustainable development. Speaking at the panel on Goal 7 “The Way Forward: Parliamentary Action for Universal Access to Affordable, Reliable and Sustainable Energy”, MP Stefana Miladinovic presented Serbia’s activities as regards the UN 2030 Agenda and the role of parliamentarians in advancing the accessibility and sustainability of energy and energy potentials. On the margins of the forum Marinkovic and Miladinovic met with the Speaker and Deputy Speaker of Indonesian House of Representatives, as well as the Chairperson of the Parliamentary Committee for Inter-Parliamentary Cooperation. Talking to the members of the National Assembly the Indonesian MPs once again affirmed Indonesia’s principled stance on the status of Kosovo-Metohija and the territorial integrity and sovereignty of the Republic of Serbia.